When we talk about kart racing games, we’ll always end up hearing Mario Kart – but what can we play if we don’t own a console from Nintendo? 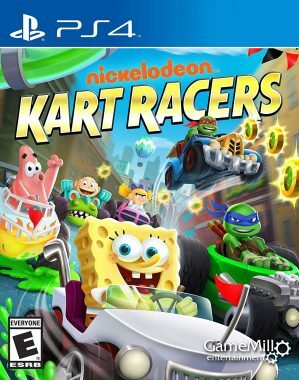 There are definitely some options out there and the newest addition in this genre is Nickelodeon Kart Racers. After my gameplay experiences with Trailblazers and All-Star Fruit Racing I liked this one the most, and no… not only because of the licence involved. As we’re not really following a story in Nickelodeon Kart Racers, there is a nice take on the so called Slime Grand Prix. During our races with the 12 familiar characters from series like Teenage Mutant Ninja Turtles, Rugrats, Hey Arnold or SpongeBob SquarePants we find ourselves on 24 different tracks, which are all slime-themed. As this feature has some impact for the overall gameplay, the developers got even more creative during the choice of your character. They don’t differ in terms of speed or handling, but every driver has it’s own special power-up. 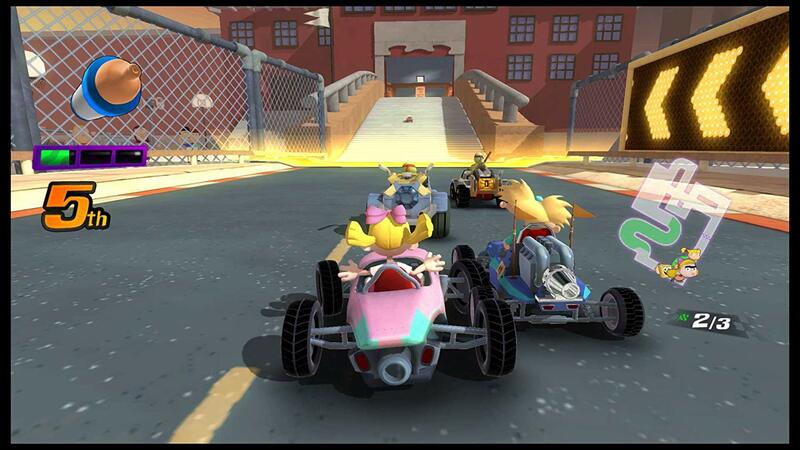 The team behind Nickelodeon Kart Racers really captured the essence of a great kart game experience, but after my playthrough I still wish there was more. As a fan of the Turtles I started to get on the first tracks with Donatello and had a great time getting to know the tracks, find some shortcuts and use the different power-ups for my advantage or against my rivals. While this is the known basic concept I really got surprised when suddenly things started to change. First of all you have to make use of the slime on the tracks to charge a boost. You can simply drive over it and it fills up, but the key is to use your boost in the right moments on the tracks. There are also coins to collect, that give you access to a shop, where you can spend them for new kart parts or cosmetics. This allows some customization although there are not a lot of options given and you can unlock everything pretty fast. As soon as I found myself prepared to start a cup, I switched from the Free Race mode to a real challenge. A cup consists of four tracks and you’ll receive points based on your placement after each round. If you end up winning the different cups, you can unlock different ones. The gameplay is a lot of fun and I think the reason is the similarity to Mario Kart. The tracks show variety and suddenly you end up with a transformation of your car into a boat as you land on a small water area. Appearing messages indicate that the last one after a timer will be kicked out of the race, which gives you additional motivation to reach one of the first positions. On another track I had to follow arrows telling me to take the left instead of the right. If I would just ignore the arrows I’d also get kicked out after a few times for not following the rules. These small but effective features make the gameplay experience a lot of fun. The power-ups are another highlight of Nickelodeon Kart Racers. They are not necessarily new ideas, but received personality with the licence involved. Good examples for this is the pizza inspired by TMNT, which will occupy half the screen blinding you or the milk bottle from Tommy chasing your opponents representing a green shell. Using all this different power-ups feels refreshing and is again, a lot of fun especially in the multiplayer. It’s possible to play with up to four players via local split screen, but there is no online support. If you are looking for another challenge, there is also an Time Attack mode available. Here’s where we notice, that this game might have had a tight budget. The presentation starting in the main menu is not very promising and also the music got really on my nerves after a while. The good part is, that this is not the case during actual gameplay. The tracks have some nice details as they are inspired from the series involved in this game. Unfortunately this is at the same time another problem, because there are only four series involved. Nickelodeon has so much content to offer and with just 12 characters from four shows, it seems like a missed opportunity. If we take a look at what Nintendo will be doing with upcoming Super Smash Bros. Ultimate, this seems like the way to go. I had high hopes for this game and in the end I’m really happy that it’s fun. At the same time I’m not satisfied, because just imagining it with more content, it could’ve turned out to be an amazing game. 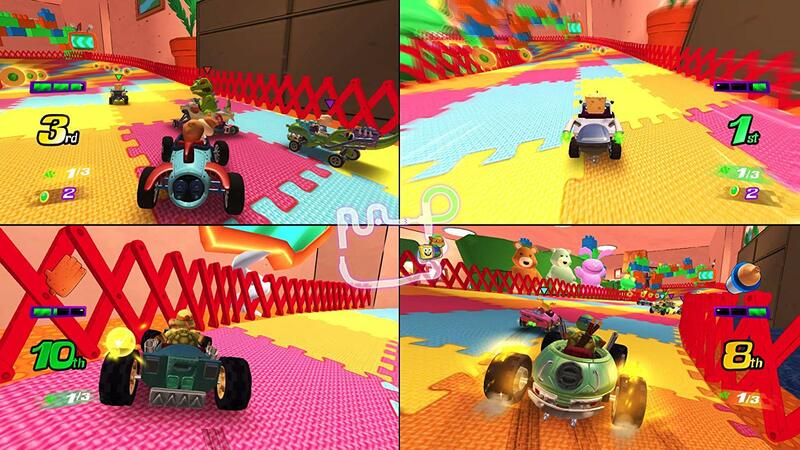 Anyway I still enjoyed Nickelodeon Kart Racers and is one of the better kart games available on consoles. Let’s see if we’ll get a second game in the future. 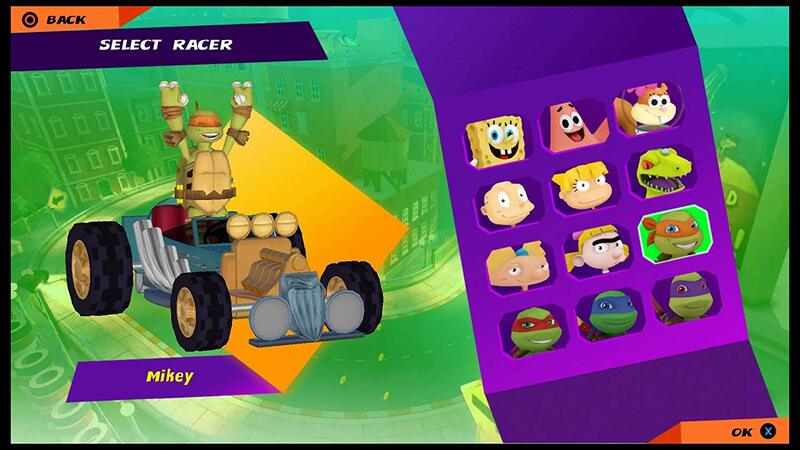 Nickelodeon Kart Racers is a great option for those who like the characters involved. Challenge your family and friends, ignore the poor presentation and it'll definitely be a lot of fun.